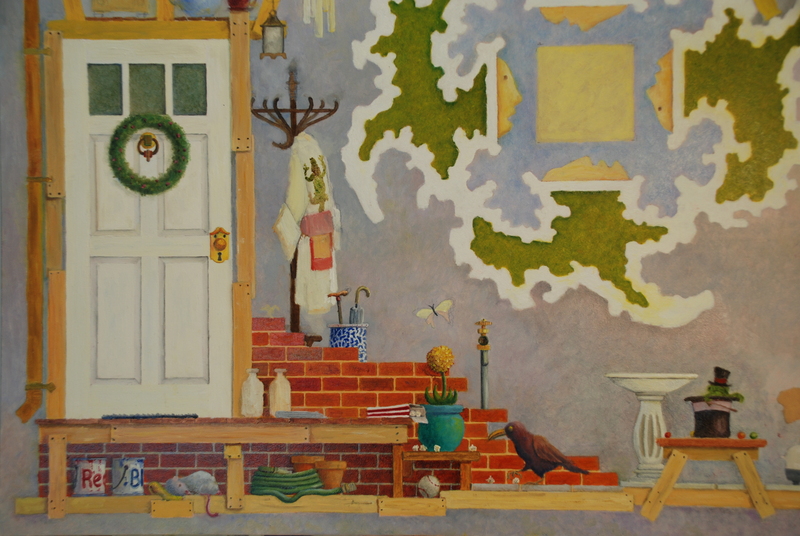 As I posted the four corners in sequence with suggestions from viewers, I will post the four corners again, showing the progress of the painting portion of “The House That Jack Built” project. While there is considerable progress in this corner, it is still not finished. With an oil painting, depending on how the paint is applied or medians added as I paint (i.e. Liquin, Linseed oil etc) drying times will vary. The newspaper on the porch and the Butterfly are two examples, both have been roughed in but need to wait 3 or 4 days for the paint to dry before I can add more detail. As I also work at finalizing different areas, a few additional objects are finding their way into the painting. One, are marbles on the table with the ‘frog in the hat’. Added a hat and cane to the frog (courtesy of a conversation with Karen) and working on adding an origami bird on the bricks near the Kimono (courtesy of a conversation with Mac and Laura). Some objects in the ‘first corner’ area still need adjustment. I am still not satisfied with the Kimono hanging on the coat rack, I have reworked it twice and still it needs some adjustment. As I now move to concentrate on the second corner, I will continually drift back into the first corner to add, tweak, and finalize various objects. Today, Monday, October 20; “First Corner Painting”. Monday, October 27 and following Monday’s; Post continuing progress images of “The House That Jack Built” painting.